Stop the hate — it’s time to love chardonnay! Everyone knows about chardonnay. Even if you do not drink it, you know it. The world’s most famous white wine grape, chardonnay is one of the most widely planted grapes. And it is the one grape that just cannot get any respect. It is popular but it is also disregarded as an overly oaked butter-bomb that is in overabundance. It is time to stop hating chardonnay because this is a grape that deserves a lot of respect. Chardonnay can be described as having fruity flavors ranging from citrus to apples to stone fruits to tropical fruits such as banana, pineapple and melon. It can be described with notes ranging from chalk and mineral to vanilla to smoke. And, on the palate it can vary from crisp and bright to creamy, rich and unctuous. But in reality, the grape variety of chardonnay is said to have a relatively neutral flavor. The grape variety chardonnay gets its flavor from the specifics of the climate and vineyard in which it is planted. Chardonnay is a grape that requires a great site and attention in the cellar. “Of all the hundreds of grapes in the world, chardonnay is one that can both show site specifics and winemaker influence at the same time,” explained wine critic Elaine Chukan Brown as she moderated a panel of six winemakers at the Santa Barbara Harvest Festival. 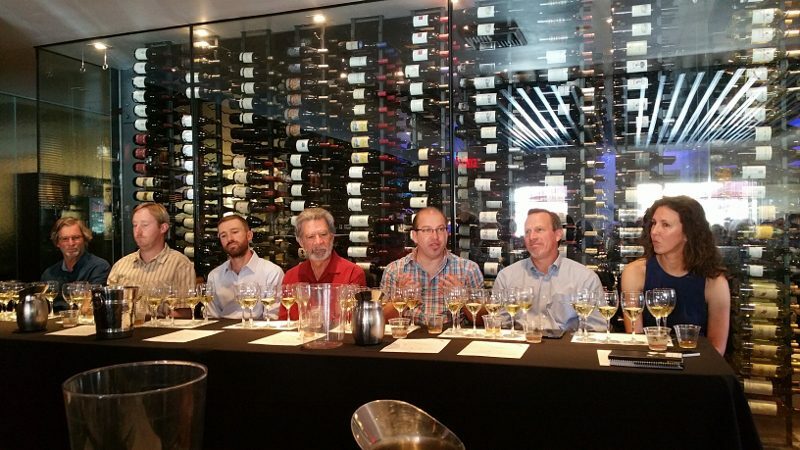 Focusing on three vineyards in Santa Barbara County, six winemakers discussed what it is about these sites that compel them to produce chardonnay. This entry was posted in Lifestyle, Wine and tagged Bien Nacido, Billy Wathen, Chardonnay, Dragonette Cellars, Elaine Chukan Brown, Foxen Wine, John Dragonette, John Faulker, Longoria Wines, Paul Lato, Paul Lato Wines, Rick Longoria, Sandhi, Santa Barbara, Santa Barbara Wine Country, Trey Fletcher, white wine, Wine, wine seminar, wine tasting by Allison Levine.